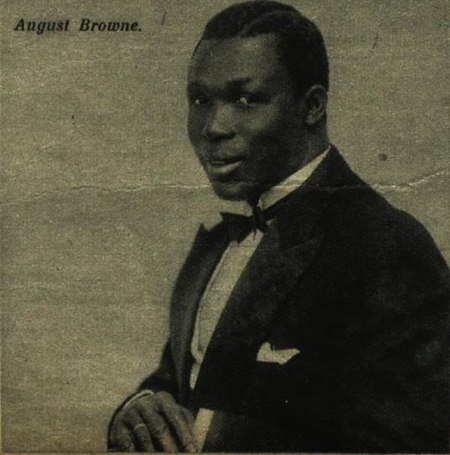 Nigerian jazz drummer August Browne was one of many foreign-born volunteers who fought in the ranks of the Polish resistance in the battles against the German occupiers during World War II. His story was recently brought to light by Dr Zbigniew Osiński from the Museum of the Warsaw Uprising. Browne, whose name also appears as O’Browne, was already a long-time resident of Warsaw—dubbed by some “the Paris of the North” because of its cosmopolitan character—by the time the Nazis invaded in September 1939. He had first come to Poland in 1922, worked in various music clubs and, according to one African music website, was the first Nigerian to record a jazz album, which was released in Poland in 1928. When the capital came under attack in Hitler’s relentless Blitzkrieg, Browne was prepared—just like the fictitious Scotsman Ketling in Henryk Sienkiewicz’s historical trilogy—to fight and die for his adopted country. He took part in the desperate and ultimately hopeless defence of the city and then again five years later in the uprising of 1944 as a member of the “Iwo” Battalion of the Armia Krajowa (Home Army), the largest resistance group. The exact number of foreign nationals who fought for the Polish cause is difficult to determine, but it is estimated that they numbered several hundred. That number represented as many as eighteen different nationalities fighting in the ranks of, or alongside, the various resistance formations throughout the course of the war, particularly during the sixty three days of the Warsaw Uprising of 1944. 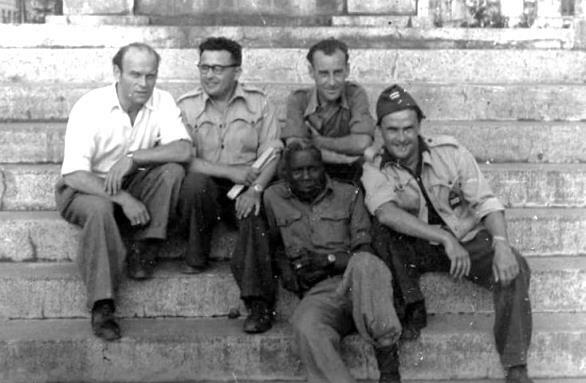 According to Polska Zbrojna, the Polish army publication, the various nationalities represented in the uprising included fighters from Hungary, Slovakia, France, Georgia, Belgium, the Netherlands, Greece, Great Britain, Italy, America, Russia and South Africa. There was also one Romanian, one Australian and one Nigerian (Browne himself). The Museum of the Warsaw Uprising says the most numerous volunteers were the Slovaks, followed by the Hungarians and the French. One of the most famous foreign units was the 535th Independent Slovak Platoon, which wore its own armbands and fought under its own banner. They were led by Miroslaw Iringh, code-named “Stanko”, who was himself a Warsaw resident and had fought in defence of the city in September 1939. In this platoon were also Georgians, Armenians, an Azeri, a Czech and a Ukrainian. Apart from the foreign fighters who were already residents of Poland, such as Browne, Iringh, and other individuals from Warsaw’s various expat communities, there were also those who joined the resistance having escaped from German prisons or work camps or even, as in the case of a few French soldiers from Alsace, having deserted from the Wehrmacht. According to the WP (Wirtualna Polska) website, there was even one German soldier who came over to the Polish side. He was given a non-combatant role: the task of looking after the casualties from among his own countrymen. A number of Hungarian soldiers, whose army was part of the Axis force and who were brought in to help quell the uprising, decided to fight on the Polish side. The remainder who did not switch sides nevertheless were mostly sympathetic to the Polish cause and tried to preserve neutrality. They deliberately avoided combat with the Poles and there are reports that in many cases they actively helped the insurgents by supplying arms and provisions and did their best to make life difficult for the Germans. An Australian, Walter E. Smith, who had been taken prisoner by the Germans on Crete and who was sent to a POW camp near Toruń in Poland, managed to escape—at his seventh attempt—with the help of the Polish resistance who had provided him with documents and civilian clothes. He made his way to Warsaw and successfully made contact with the resistance without knowing a word of Polish. He took part in the ’44 uprising and witnessed the Nazi reprisals. He survived and returned to Sydney. His story can be found (in Polish) here. Other noteworthy individuals who ended up fighting in the ranks of the AK are British RAF pilot John Ward, who escaped from a German POW camp in 1942 and broadcast over one hundred messages to London during the uprising over the Błyskawica radio station. British Flying Officer Thomas Philip Edward “Terry” Blatch was the wireless operator of an aircraft which caught fire and had to be abandoned over Heraklion in Crete in September 1942. Blatch was captured by the Germans, imprisoned at Stalag VIII-B at Lamsdorf in Silesia, but managed to escape and then made contact with the Polish resistance. He subsequently went on various sabotage missions, including the destruction of German road convoys and an attack on the local SS headquarters at Przemyśl. He was captured and imprisoned in Kraków’s Montelupich prison, where he was kept for three weeks under sentence of death. He was returned to Lamsdorf, but escaped again. After yet another arrest, imprisonment and escape, he took part in the Warsaw Uprising and was even in command of a company after the Polish commander was wounded. His story can be found in Free to Fight Again: RAF Escapes and Evasions 1940-45 by Alan Cooper. Among other foreign fighters were Czech Albin Huska from Moravská Ostrava and Hungarian József Vonyik. A memorial to Vonyik and several of his unidentified Hungarian colleagues can be found at the Okęcie cemetery in Warsaw. An unnamed Frenchman, known only as Gwiazdka (Little Star), earned his nickname because of his talent as a crack shot. According to Marta Tychmanowicz at Wirtualna Polska, he was killed trying to disarm a German “Goliath” remote-controlled tank. 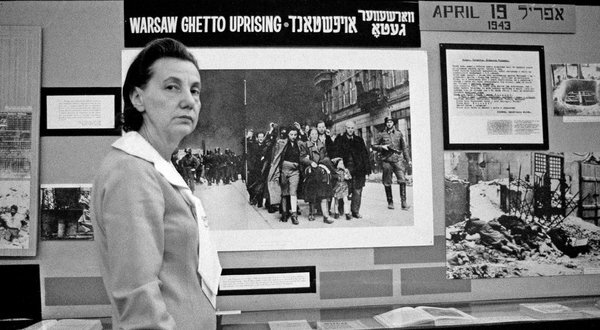 The Jewish fighters who joined the mainstream Polish resistance after the crushing of their own desperately heroic 1943 Warsaw Ghetto Uprising do not come into the category of foreign fighters, since they were, for the most part—like the famous Marek Edelman—Poles by birth. However, most of the 348 Jewish prisoners, who had been freed from the Gęsiówka Concentration camp in Warsaw during the ’44 uprising by the Armia Krajowa’s “Zośka” Battalion and who joined the resistance and fought in the increasingly desperate combat, were originally citizens of countries such as Greece, Holland, Germany, and Hungary. The course of the Warsaw Uprising is well documented. The arguments about whether the action was justified, in the light of what the leadership of the Armia Krajowa must have known about Stalin’s attitude to the insurgents, are still ongoing. 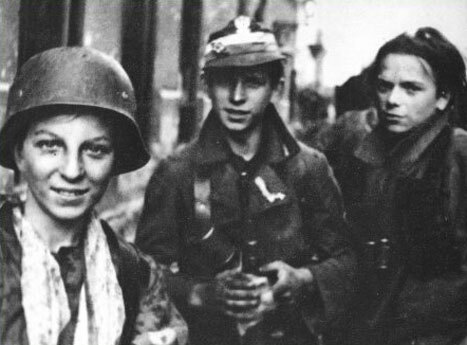 Unlike the Jewish insurgents in the Warsaw Ghetto of the previous year—who had taken on the might of the German army and had been ranged against overwhelming odds with never any real chance of success, but who had fought for nothing but honour—the resistance fighters in August 1944 were, on the face of it, in a different position. The Red Army was pushing the Wehrmacht back towards their own borders and a city-wide revolt against the occupying Germans seemed like a realistic undertaking, especially as Soviet radio had been encouraging the citizens of Warsaw to take up arms against the occupiers. Despite initial successes after spirited fighting by the resistance soldiers and the city’s inhabitants and despite the efforts of the western Allies to supply and support the insurgents by long-range air drops, the uprising became a hopeless cause when the expected Soviet assistance failed to materialize. It became quite clear that Stalin was in no hurry to intervene and was evidently not concerned about the prospect of Warsaw going up in flames. Nonetheless, it would be inaccurate to say that there was absolutely no Russian assistance at all. Apart from those Russians (and other Soviet soldiers of various nationalities) who had escaped from German POW camps and elected to fight with the Polish resistance, there were also—according to Wirtualna Polska—individual Russian soldiers who fought alongside Poles in a formation which was commanded by a pro-Soviet Polish general and was attached to the greater Red Army. This formation was brought into the fighting extremely belatedly. Whether this was a result of Stalin wanting to placate the Western Allies who were putting pressure on him to act, or else was an initiative of the Polish commander himself, the outcome was that some of the Polish units tried to force their way across the river from the eastern suburbs and sustained catastrophic losses. Ultimately the heroism and desperation of the insurgents was no match for the overwhelming firepower of the German army and SS and the crushing of the uprising became one of the grimmest episodes of the war. The Nazis were largely unimpeded as they systematically razed the city, carried out savage reprisals against the combatants and committed atrocities against the civilian population. By October it was all over. The insurgents were left with no choice but to surrender. The fates of the survivors varied: some were transported to POW camps in Germany, others to concentration camps. The total civilian deaths are estimated at anywhere between a staggering 180,000 to 200,000. And just as the victorious Roman army had levelled Carthage, so a vengeful Hitler ordered that Warsaw should be reduced to ashes and rubble. Most of the city was completely demolished. As for August Browne himself, according to various online sources, he survived the destruction and the carnage and remained in Warsaw for some years and, like Władysław Szpilman of “The Pianist” fame, he took up his pre-war profession as a musician again. Although it would appear that he was recognized for his role in the resistance by the post-war Communist authorities, nevertheless, he decided to leave Poland in 1958 and settled in Great Britain. His exact reasons for the move and how he fared in the UK may come to light one day. May I reply by saying: dear Ewka. Your comment would make perfect sense if the above article had not mentioned Germans or Germany. The very first sentence talks about Germans occupying Poland. I invite you to count the number of times the Germans are mentioned. In the context of World War Two, Nazis are – whether one likes it or not – synonymous with Germans. PS – and, to complicate matters, not all who fought for the cause of the German National Socialist Party were themselves German, of course. There were other nationalities fighting under the banner of the Third Reich. So the term “Nazi” is a useful short-cut to include Germans, Austrians and whoever else fought in Hitler’s army. I agree with you about the use of the term “Nazis”, but I think you made a mistake in saying that there were fighters from “America” on the Polish side. There are more than 25 countries in America (including mine, Guatemala), so which one is it? If you mean to say, “United States”, then say that, otherwise you’re being vague. “US”, “USA”, “United States of America” are also correct. “America” is not, as it refers to a whole continent. Of course, colloquially America is usually understood as being the US, but I wouldn’t expect the term to be used like that in the context of historical facts. Mr Solares makes a good point. 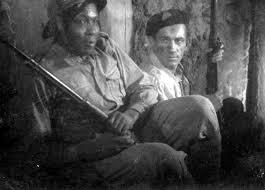 The American I had in mind was Richard Cosby from the U.S., father of journalist Rita Cosby, but I have since discovered that he was originally Ryszard Kossobudzki, so I suppose he did not qualify as a foreigner at the time of the Uprising. I could find no record of any other Americans, either from the U.S. or from any South American countries taking part in fighting on Polish soil, although I believe that a unit from Brazil fought alongside the Polish army in the Italian campaign. Having said the above, it must be remembered that airmen from the U.S., Canada, Great Britain and South Africa flew long-range missions from bases in Italy to drop supplies and equipment to the fighters in the Uprising and many lost their lives. Naturally, I would welcome any additional information about this rather little-known aspect of the Polish war effort. The Commonwealth airmen who flew long-range missions from Italy also included fliers from Australia and New Zealand. Thomas Keneally (who cannot be accused of being overly sympathetic to the Poles), writes on p. 312 of ‘Schindler’s List’ that an Allied bomber, which had been shot down by the Luftwaffe, crashed near Schindler’s Emalia factory. “What these Australians had been doing,” writes Keneally, “was dropping supplies to the partisans in the primeval forest east of Cracow”. In fairness to T. Keneally, there is a positive portrait of a non-Jewish Pole in his book and that is the pharmacist Tadeusz Pankiewicz. In case my earlier reply was lost in the ether, may I just say that Mr Solares is right and the American in question should have been specified as a U.S. Citizen. I had in mind Richard Cosby, father of broadcaster Rita Cosby. A little bit of further research revealed that he was not a U.S. Citizen at the time of the Warsaw Uprising and that his name was originally Ryszard Kossobudzki. My mistake. Thank you Michal, very interesting finding about the Brazilian Expeditionary Force by the way. I seem to remember hearing about a unit of the Mexican Air Force that also took part in some operations, this would be worth looking into. These are not cases specific to the Polish war effort but still quite interesting. Thanks, quite interesting. You may want to write a new article about all these lesser-known fighters! I’ve just discovered someone who wasn’t with the Resistance in Poland, but is most definitely worthy of a mention on this page. An American (US citizen), served with the 1st Polish Parachute Brigade. It seems he had no Polish ancestry, but volunteered to serve with the Poles. Richard K. Tice was killed in action during Operation Market Garden at Driel in the Netherlands. He was 22. Here’s another find: Ron Jeffery was a Brit in the Polish Resistance. There’s a book and a film. I have always been fascinated by the Polish Resistance. I am a Nigerian and I am proud to know one of my countrymen was part of this great event in the history of the world.